A Boy, An Injury, A Recovery, A Miracle? The Vatican is delving into the case of a 6-year-old boy in Washington state whose doctors say a flesh-eating bacteria nearly killed him. The Catholic Church is trying to determine whether his recovery is a miracle that can be attributed to a Native American who lived in the 1600s. A Boy, An Injury, A Recovery, A Miracle? Jake Finkbonner, shown with his father, Donny, and mother, Elsa, nearly died after contracting a flesh-eating bacterium. His family and friends prayed for a miracle, and now the Vatican is investigating whether one actually occurred. Pope John Paul II will be beatified in May, which puts him halfway toward sainthood. To have gotten this far, the Vatican must believe that the late pope is responsible for a miracle. Earlier this year, the Vatican declared that a woman was miraculously healed from Parkinson's disease after she prayed to the late pontiff. And this raises the question: How does the Vatican investigate miracles? Let's start in Ferndale, Wash., where a potential miracle is under investigation. Jake Finkbonner sits on a couch flanked by his mother, Elsa, and father, Donny. Jake, who just turned 11, is a little shy. He doesn't quite look you in the eye, and you wonder if it's because of the scars on his face. He describes the terrible day that changed everything: Feb. 18, 2006. "It was the last game of the season, and it was the last minute of the game," his mother begins. "I was driving for a lay-in," Jake says, picking up the thread, "and then I got pushed from behind the back, and I hit my lip on the base of the basketball hoop." "The game ended, and I told him to get some ice cream, you know, 'Get something on that lip,' " Donny recalls. "And I was thinking to myself: 'It's his first big fat lip.' "
But overnight, Jake developed a raging fever. His entire face swelled, and a day later, he was in the hospital. "I walked in the room, and my heart sank when I saw his face," Donny says. "And he said, 'Hi Daddy!' But he couldn't see me because his eyes were swollen shut." Dr. Richard Hopper, chief of plastic surgery at Seattle Children's Hospital, says Jake's infection had a life of its own. At the trauma unit at Seattle Children's Hospital, Craig Rubens, a pediatric infectious disease specialist, instantly suspected a flesh-eating bacterium called strep A. It was consuming Jake's face with terrifying speed. "It's like lighting one end of a parchment paper," he says, "and you just watch it spread from that corner very fast, and you're stamping it on one side, and it's flaming up on another." 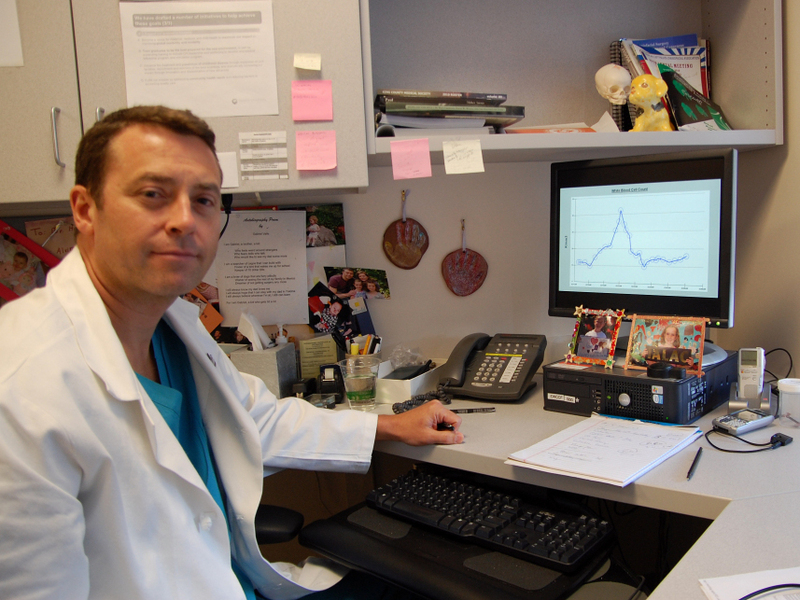 Dr. Richard Hopper, chief of plastic surgery at Seattle Children's, had never seen a case so dire. "It's almost as if you could watch it moving in front of your eyes," he says. "The redness and the swelling — we would mark it and within the hour it would have spread another half-inch." In his office, Hopper turns his computer and displays gruesome photos charting the bacteria's steady march from Jake's lip to his cheeks to his scalp to his forehead. Each day surgeons removed more of his skin to get ahead of the infection. "The infection was like it had a life of its own," he says. 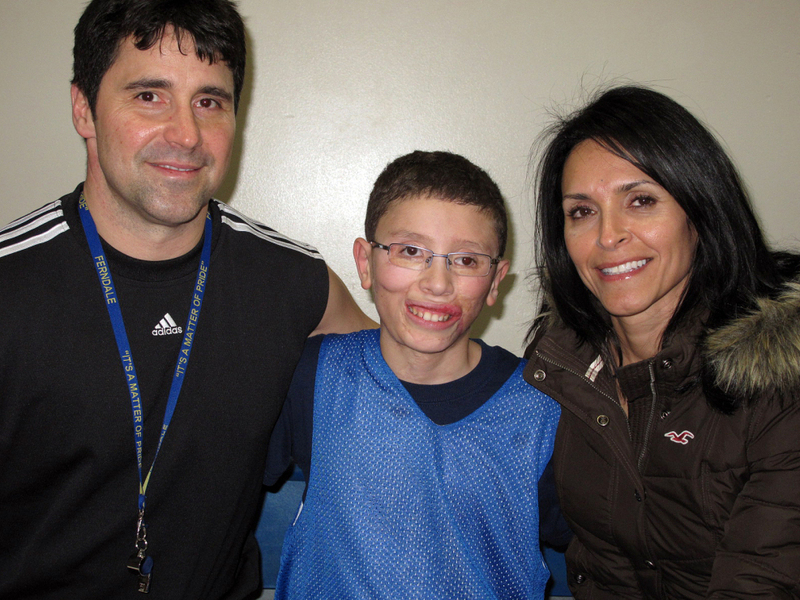 The doctors told Jake's parents several times that their son would probably die. Elsa Finkbonner called a Catholic priest, who gave the boy his last rites. "Donny and I went off to the chapel and just surrendered Jake back to God," she recalls. "We just said, 'God, he is yours. Thy will be done, and if it is your will to take him home, then so be it.' "
They also prayed desperately for a miracle, and soon others — many others — were doing the same. "Things were looking so grim for Jake that we needed all the prayers we could get," recalls their priest, the Rev. Tim Sauer. And because Jake is half Lummi Indian, Sauer urged parishioners at St. Joseph's Catholic Church to appeal to a woman who lived 350 years ago. 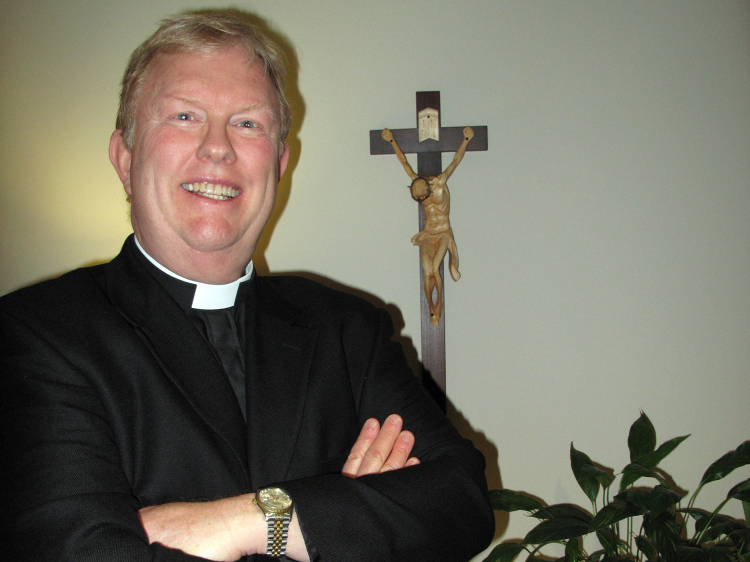 "I encouraged people to ask for the intercession of Blessed Kateri," he says. Kateri Tekakwitha was a Mohawk who converted to Catholicism. Her face was scarred by smallpox. Legend has it, when she died, her scars vanished. She was beatified in 1980, the step before sainthood. Sauer says Kateri was the perfect intercessor for Jake. "No. 1, we're talking about two young people," Sauer says. "No. 2, we're talking about two people who come from Native American ancestry. And No. 3, we're talking about a person who herself suffered from a disease that disfigured her face." Annette Bagley, the mother of Jake's best friend, recalls how the church and Jake's school began praying to Kateri. She says the prayers went viral. "The kindergarten class that Jake was in started hearing back from relatives: 'Tell them we're praying for him in Denver! Tell them we're praying for them in London! Tell them we're praying for them in Israel!' " she says, laughing. "I mean, just all over the world, so we got a big map and we had the kindergartners put pins on the map everywhere in the world where someone was praying for Jake." As Jake hovered between life and death in the hospital, a representative of the Society of Blessed Kateri visited him. She gave his mother a pendant with Kateri's image on it. Elsa Finkbonner placed it on her son's pillow. "That was the last day that his disease progressed," Elsa says. "And the next morning when they had taken him in for surgery, that was when they told us the news that it had finally stopped." Surgeon Richard Hopper says after two weeks and a dozen surgeries, the team of doctors had little hope they could get ahead of the bacteria. And when they realized they did, he says, it was breathtaking. "All of a sudden, to have this infection stop is almost like a geyser coming out of the earth with this great roar — and all of a sudden it just stops. And there's silence. And everybody's just a little bit stunned by it being over," he says. Jake went home after two months. Now, five years later, doctors are rebuilding his face, little by little. Rubens at Seattle Children's Hospital says it's one of the most amazing recoveries he has seen. Elsa Finkbonner goes further. "There's no question in my mind that it was in fact a miracle," she says. But does the Roman Catholic Church believe it is? To qualify as an authentic miracle, the Vatican has to determine that Jake's recovery was unexplainable and that it occurred because people prayed to Kateri to intercede with God on Jake's behalf. The Rev. Paul Pluth is coordinating the investigation into Jake's recovery. The Rev. Paul Pluth, who is coordinating an investigation into Jake's recovery, says that would suggest Kateri has special access to God. "That means we have received assurances that this person now stands in heaven before the throne of God," he says. And historically, "one of the evidences of that has been miracles of healing." These days, the bar is pretty high, says the Rev. Peter Gumpel, a Jesuit priest in Rome who has investigated more than 100 potential miracles for the Vatican. "The Catholic Church has many hundreds — even thousands — of saints," he says, "and the idea is not to get more." Under Pope John Paul II, it was relatively easy to attain sainthood. In 1983, the late pope made the process quicker, easier — the number of miracles required dropped from two to one — and less adversarial because he eliminated the office of the "Devil's Advocate" at the Vatican. Thus John Paul produced more saints than all the popes in the previous 500 years. The process is more rigorous under Pope Benedict. Gumpel says that the Vatican does not want to approve miracles lightly, thus misleading people or looking foolish if the "miracle" turns out to have a logical explanation. The church dismisses about 95 percent of the miracle petitions it receives, he says, adding that there are a number of hoops to jump through, from interrogating witnesses to examining medical records to calling on medical specialists and theologians before finally — often years later — presenting the evidence to the pope. "It has to be rigorous," he says, "because we do not want to submit to the pope a statement unless we are absolutely, morally certain that this case merits to be approved by him a miracle by God." Now investigators in Seattle are putting Jake Finkbonner's extraordinary recovery on trial. For more than three years, a team of priests has collected documents and interviewed witnesses. There are a lawyer, a priest with medical training and a skeptic who goes by the title of "promoter of justice," the role once called the devil's advocate. Eusebio Elizondo, the church's "devil's advocate," is supposed to find weaknesses in the alleged miracle. 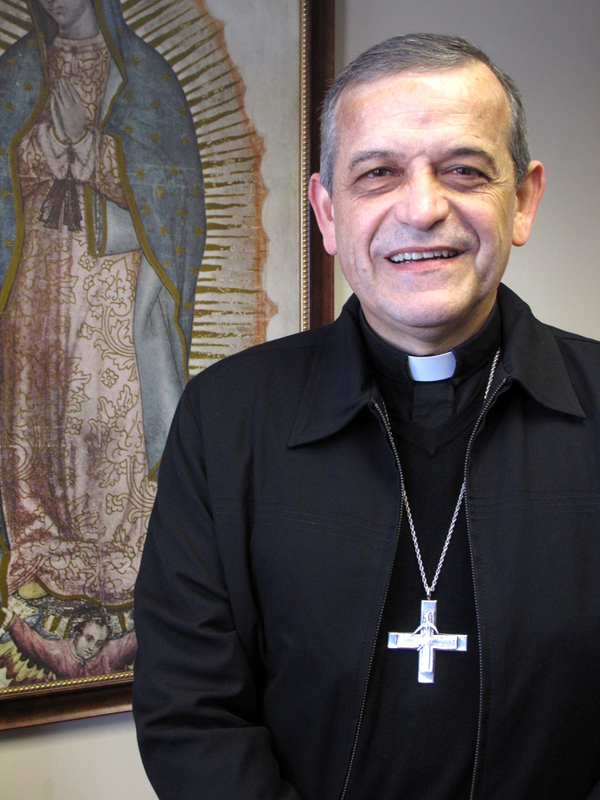 That skeptic is Eusebio Elizondo, the auxiliary bishop in the Archdiocese of Seattle. He tried to find holes in the case. "In old times it used to be called the devil's advocate," says Elizondo. "I'm trying to really push every single witness [and asking], 'Really, are you sure? Are you positive that there's no other way to explain this, a logical explanation or a scientific explanation or it was a pure coincidence?' "
The panel interviewed each doctor for more than an hour, asking details about Jake's condition, his recovery after each surgery, fatality rates. They asked nothing about miracles. Rubens says they were the consummate professionals. "They took a very hard look at whether this really was something beyond what they described as the wonders of modern medicine," Rubens says. The doctor says he didn't get the feeling at all that they were stacking the deck. But Joe Nickell, a paranormal investigator, says there is "no evidence that a miracle took place." Nickell, who writes for Skeptical Inquirer, a magazine put out by the Committee for Skeptical Inquiry, says the whole investigation is a joke. Jake received the best medical care, and therefore it's hardly surprising that he recovered. Nickell says when the Catholic Church confirms miracles, it's using what is called an argument from ignorance. "They're starting with a mystery, and they're saying, 'We don't know why this person's illness went away.' And then they say, 'Therefore, we do know! It's a miracle!' "
Still, Jake's doctors believe the family's faith was crucial. "What Jake survived was truly remarkable," Rubens says, "and I can't explain why he would survive over someone else." Whether or not Jake's recovery was due to the intercession of Kateri Tekakwitha will be a matter for the pope to decide, perhaps years from now. As for Elsa Finkbonner, she thinks Kateri does deserve to have Catholicism's highest honor. "It would be disappointing if she didn't get to be a saint," she says. But in the end, that's not really the salient issue. Her son is. "I'm just happy to celebrate Jake's 11th birthday."